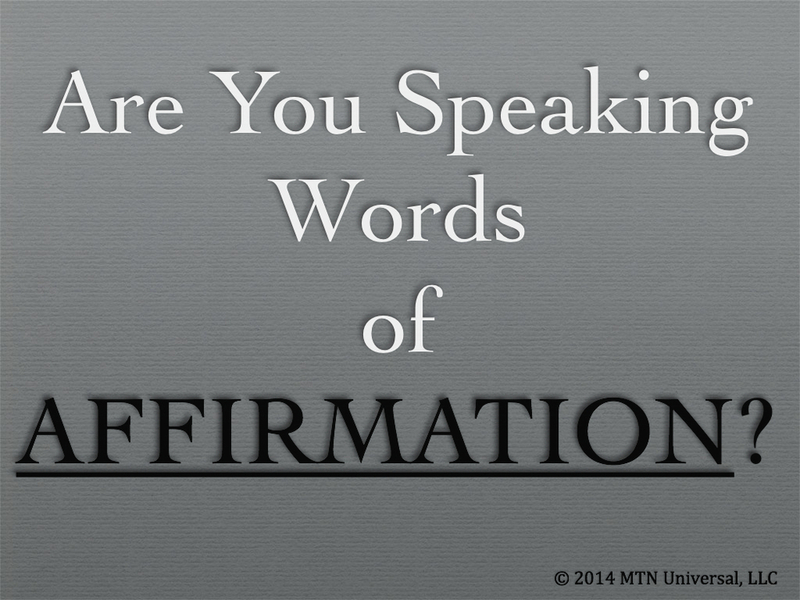 Are You Speaking Words of Affirmation? There are over 430,000 words in the Woordenboek der Nederlandsche (WNT), which is the world’s biggest dictionary. Out of all those words, how have you shaped your vocabulary? One of the most important things in life is developing your vocabulary. Believe it or not, your vocabulary can determine your life’s success. Vocabulary can build or tear down. We all have witnessed the person who says, “Today is going to be a bad day.” And guess what, the day ends up being a bad day. On the contrary, we know those people who talk about how great their day will be. And guess what, their day ends up being great. What’s the secret, if there is a secret? It’s all about speaking words of affirmation, which is defined as words of encouragement or support. So, are you speaking words of affirmation? Let me share 3 ways to speak words of affirmation into your life. Before you can speak words of affirmation, you must know your temperament. Just as it is natural for people to speak their primary language, there are some people who naturally speak with words of affirmation. Make no mistake about it; speaking words of affirmation is a language. If you are unfamiliar with this language, I believe you should get well acquainted with this form of language. If you have a negative personality, the first step to speaking words of affirmation is being aware that negativity is part of your personality. Knowing this information will help you recognize your tendencies and what needs to be done to change your personality from a negative to a positive one. Even if you are already speaking words of affirmation, it’s important to continue to speak words of encouragement to yourself and others. Another way to speak words of affirmation is to think positive. Those who sit around thinking negative will always receive negative. Instead of focusing on the negative, why not focus on the positive? I believe most of us know our personalities, but this can be a tough step to speaking words of affirmation. Thinking positive means disciplining and conditioning the mind. You will train your mind to release those thoughts and words that are negative, in turn causing you to hold tight to those thoughts and words that are positive. Your perspective will be quite different once you start thinking positive. Rather than seeing the glass half empty, instead you will see the glass half-full. Try it for one day! Every situation that day, think of something positive to say whether the situation is full of good or bad. If you think it, you will be it. Helping when you don’t feel like helping, etc. By no means am I suggesting for you to let people run all over you. However, just like no one wants to be around a negative person, your mind doesn’t want to be around negative thinking. Our minds hate negative thinking. It’s called stress. And we all know that stress can kill. Today, I challenge you to start speaking words of affirmation. Start with one positive encouraging thought a day and increase your affirmations once you are comfortable with that daily routine. Why is ME Time Essential?